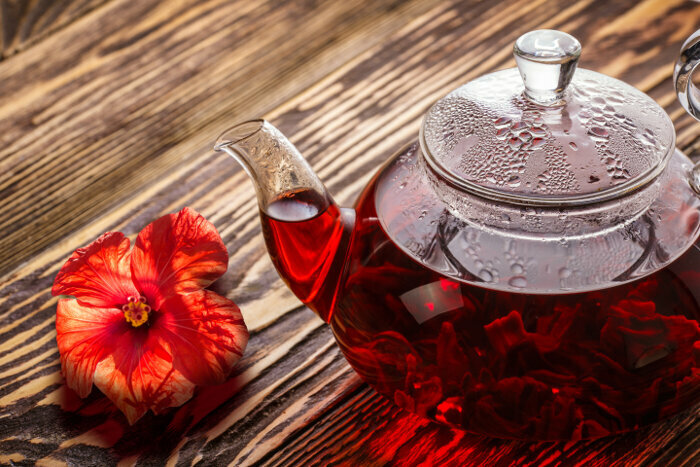 Hibiscus tea has been used since ancient times to treat a variety of conditions. The ancient Egyptians used hibiscus tea to maintain their body temperature and keep cool in summer while Iranians commonly used it to treat insomnia and restlessness. The hibiscus plant is grown in tropical regions for its beautiful blooms. What is the Hibiscus Plant? The hibiscus plant (Hibiscus sabdariffa) is a perennial shrub that grows to heights of 9 feet and has a spread of 6 feet or more. This tropical plant is native to Asia and the Pacific Islands. It can be grown in USDA Plant Hardiness zone 9 though 11 or any area that is frost free. In colder regions it can be grown in pots and over-wintered inside the home. The hibiscus plant produces masses of showy, papery flowers in mid summer. When the flowers fade and the petals drop, the bright red calyx remains. The calyx is the name of the group of sepals that cover the bud before the flower blooms. While the entire flower can be used for making tea, the calyx or dried flowers are most often used. What is Hibiscus Tea Good For? Lowers Blood Pressure: A 2003 study at the College of Medicine of the University of Lagos revealed that hibiscus tea may be effective in lowering blood pressure and may have other heart protective properties. Lowers Cholesterol: A 2009 study conducted at the Shahid Sadoughi University of Medical Sciences concluded that hibiscus tea lowers cholesterol in people with diabetes. Fights Colds & Flu: Hibiscus tea is high in Vitamin C which is thought to help fight off colds and flus. Helps with Weight Loss: Hibiscus tea is thought to help maintain a healthy weight and may promote a gradual weight loss. Fights Some Cancers: A 2000 study from the Chung Shan Medical and Dental College revealed that hibiscus tea contains some cancer fighting properties and may be effective against some cancers, particularly in the early stages of cancer growth. What Does Hibiscus Tea Taste Like? Many people describe the flavor of hibiscus tea as tart with a cranberry-like flavor. It is often served with a sweetener to enhance its natural flavor and temper the tartness. 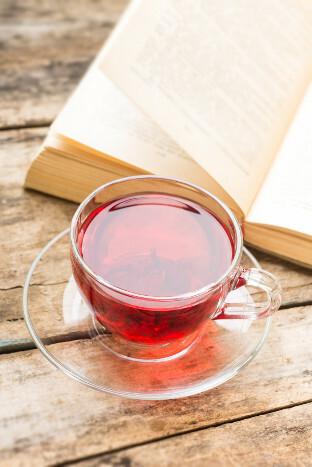 This bright red tea has a distinct herbal fragrance. Citrus and cinnamon enhance the flavor of hibiscus tea. For a change of pace from plain hibiscus tea, try this tasty combination. Place the hibiscus flowers and cinnamon stick in a bowl or pot and cover them with 24 ounces of boiling water. Allow them to steep for 20 minutes. Strain the tea and add orange slices and sugar. Stir to dissolve the sugar. Serve warm or pour it into glasses of ice and garnish with a lemon slice. We liked Celestial Seasonings Wild Berry Zinger that contains hibiscus, strawberry, cranberry and rose hips for a quick pick-me-up. This tea comes in stringless bags so there is less waste and is naturally caffeine free. The ancient Egyptians thought hibiscus tea made from red hibiscus flowers caused women to have promiscuous feelings. Egyptian women were forbidden to drink red hibiscus tea. Some hibiscus flowers change color as they age. The hibiscus flower is known as the “shoe flower” in Asia because it is used to polish shoes. In India, red hibiscus flowers are given as offering to the goddess Kali. It is believed she will grant the wish of those who offer her favorite flower.